In addition to wide range of heated towel rails and designer towel radiators, we also offer expert advice, technical help and guidance to all our customers and web site visitors. 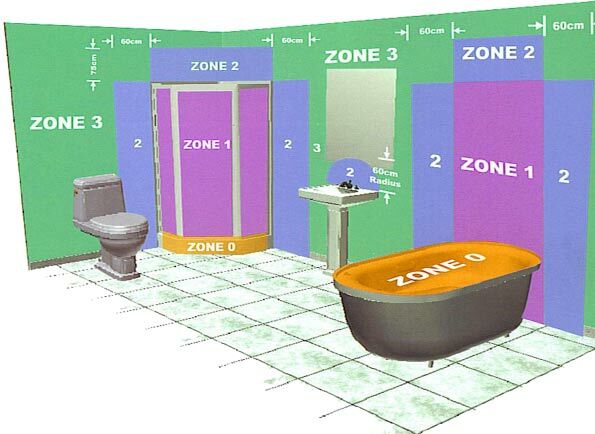 Our help & advice section is full of useful information, technical details and resources which will help you learn more about bathroom radiators and how they are used. Not only will it also assist you in understanding your own requirements it will also help you make the right choice and purchase the correct parts. 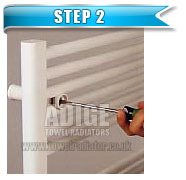 There are 3 possible ways you can introduce a towel radiator to your bathroom. First and most common option is a straight forward “central heating” type connection. If, however, you live in a flat and do not have a gas supply to your property, you can still install a towel radiator by converting it to an “electric only” type usage. The third and final option would be a “dual fuel” type connection where the towel radiator is connected to your central heating but it also has an electric heating element installed in it, which can be used in summer months when the central heating is off. Please use coloured boxes below to find more about each usage type and parts required. To help you understand which part goes where and to give you some visual aid, we have created our connection types page which you can reach by clicking on the green box below. This page illustrates possible connection types for bathroom radiators. You may also have a look at our 5 Steps Buyer's Guide for more information. If you are still not sure about which product suits you most or simply have further questions, you can also visit our "Heated Towel Rails Frequently Asked Questions" section or alternatively call our Sales Department on 020 8892 0932where a member of our team will be happy to help you. All our ADIGE branded standard towel rails and designer towel radiators have their own technical drawings which you can view by selecting "technical drawing" tab on each products’ detail page. Below is a sample drawing which shows some important measurements for our standard towel rails. 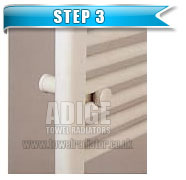 *All towel radiators are supplied with 4 adjustable brackets enabling you to adjust the distance between the wall and the centre of the radiator (centre of the air vent - bleed valve) to a value between 75mm and 95mm. Please note that the actual projection from the wall to the front of the radiator is minimum 90mm and maximum 110mm. These figures only apply to FLAT radiators. You will need to add an additional 30mm to 60mm to CURVED radiators. i.e., a 400mm wide curved radiator will protrude approximately 30mm further than flat models whereas a 700mm wide curved radiator will protrude approximately 60mm more than that of the flat version. Please refer to technical drawing of individual items for accurate information.